Reflective Aluminum parking signs will reflect at night when hit by light. Aluminum parking signs will never rust. 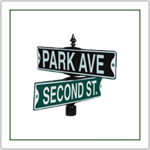 SignOutfitters.com has over 500 of the most popular styles of street and custom parking signs - in stock and ready for fast shipment. Some of our most popular street signs are Handicap Parking Signs and No Parking Signs. 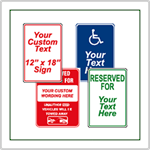 We also stock state specific handicapped parking signs for most states including California, Florida, Connecticut, New Jersey, Pennsylvania and New York. Our Parking Signs are made from .080 Aluminum - This is HEAVY DUTY Aluminum Material. It meets all MUTCD requirements. 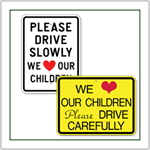 Don't be fooled by other companies selling inferior and thinner parking signs online. Parking signs made from thinner Aluminum are more subject to being bent - during installation, thru accident, or vandalism. Make sure your custom parking signs are made from .080 Thick Aluminum - Don't settle for less. If .080 is not being advertised you will most likely receive a product of inferior quality. 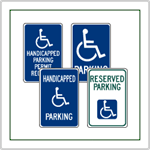 Handicap Parking Signs - Many popular styles including state specific handicapped parking signs for Californina, Pennsylvannia, New Jersey and others. Disabled Parking Signs for all applications. 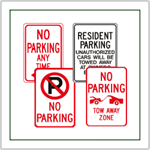 Parking Signs and No Parking Signs - Over 300 variations of metal signs in stock including Fire Lane, Resident Parking, Tow Away Zone Signs, and Reserved Parking Signs. 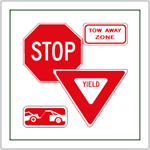 Stop Signs and Yield Signs - Available from stock in four sizes. 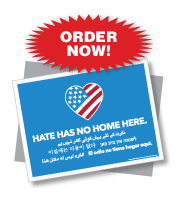 2-Way, 3-Way, and 4-Way placards ready for nationwide shipment. Street Signs - For Municipal and Private use. Available in embossed steel, extruded, and flat Aluminum versions. Personalized Street Signs. These are the same signs your local Road Commission uses. Custom Parking Signs - We make custom signs. If you do not see a sign that fits your needs have us make a custom sign for you. 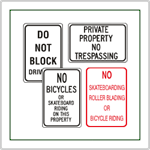 Regulatory traffic signs will keep your parking lot, private roads, and subdivisions safe. 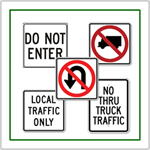 Limit traffic volume with signs like: "Local Traffic Only" and "No Thru Traffic". Keep your private roads - private. 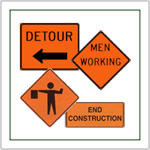 Road Construction Signs - Standard road work and men working signs including detour and directional detour signs. 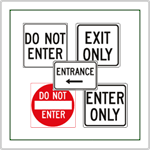 Directional Traffic Signs - Roadway marking signs. 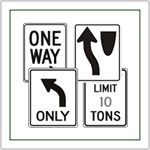 Indicators for one way, right turn and left turns, weight limits, and do not enter signs. 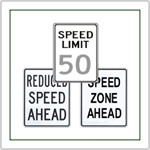 Speed Limit Signs - Speed signs including reduce speed ahead, speed zone ahead and custom speed limit signs. 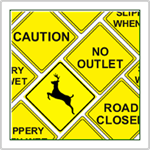 Yellow Diamond Signs - Visible warning signs in yellow and black designs. Caution, Road Closed, Slippery When Wet and many others including Deer Crossing and Cattle Crossing Signs. 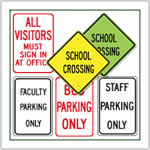 School Signs - Help make your school parking safer with a properly marked parking lot. Indicate clearly your pick-up and drop-off parking lot procedures. Clearly mark school crosswalks for student safety. 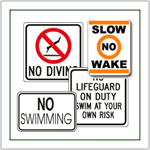 Swimming Pool Signs - No Diving, No Swimming, or Lifeguard on Duty signs in stock for fast nationwide shipment. 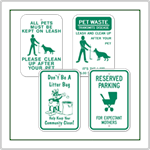 Parking Lot Signs and Property Management Signs - Signage for use in strip malls, retail centers, apartment complexes, and all types of parking centers. Premade with the most popular messages. Marine Signs for private and municipal use. 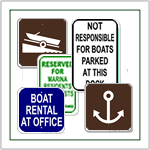 No Wake Signs, Slow No Wake, Slip Parking Signs made from rust free aluminum. Perfect for any marina or waterway. 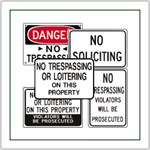 No Trespassing Signs and Private Property Signs - These signs say it all - No Trespassing. 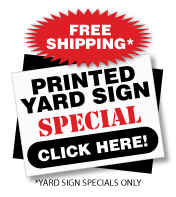 For large quantities of no trespassing signs visit our yard sign page for an inexpensive sign made from corrugated plastic. No Wake Signs for private and municipal use. 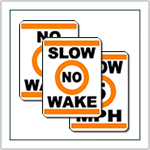 No Wake Signs, Slow No Wake, made from rust free aluminum. Perfect for any marina or waterway. Courtesy Signs - Friendly reminders signs about pets and litter. 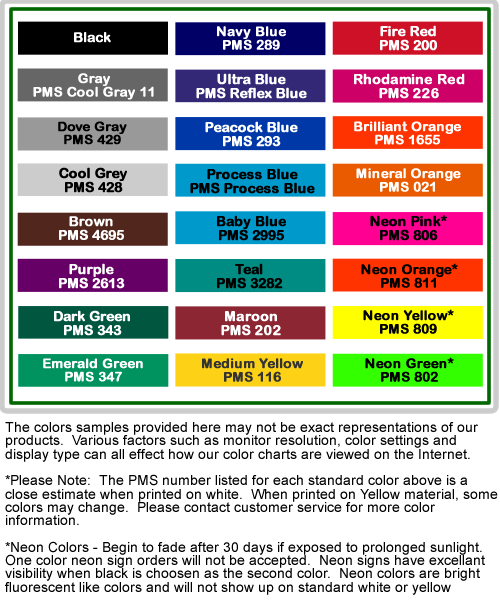 Informational Signs - Many popular styles with internationally recognized symbols. 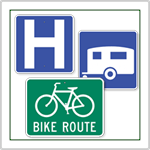 Hospital, Library, Camping, and Bike Route Signage. 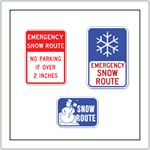 Snow Route Signs - Safety reminders for winter time parking. 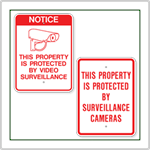 Surveillance Signs - Notify the public about video taping and surveillance cameras. 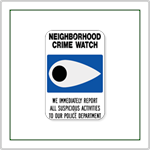 Helps deter crime.